Successfully Added Car DVD VCD CD USB SD MMC WMA MP3 Player with Bluetooth to your Shopping Cart. Supporting a wide range of discs and file formats, this 1-DIN multimedia center is great for enjoying all your favorite music and videos while you drive. Pop in your burned CD-RW/DVD-RW discs or USB/SD/MMC memory cards to play your favorite songs. If you ever run out of your own media files, you can always use the high quality CD player and AM/FM radio tuner. Pair your Bluetooth-capable cell phone with this multimedia center to enjoy the added convenience of handsfree calling. Your phone's audio is routed to your car's speakers, while you speak through the media center's built-in microphone. With no pre-installed screen, the DVD player function gives you the freedom to choose a monitor that is the right size for you and install it anywhere you want in your car. Go ahead and buy a big screen monitor, install it behind the driver's area, and give everyone a safer, more enjoyable ride. Functionality, flexibility, and great value make this product great for car owners who wants to enjoy their media files and Bluetooth handsfree calling in their vehicles as well as resellers looking for a hot new item. Order a sample now, then order in bulk to enjoy even greater savings. Brought to you at an unbeatable price by the leader in factory-direct electronics: Chinavasion. Very fast shipping as Peter Verhoeff mentioned. 3 days to the Netherlands. 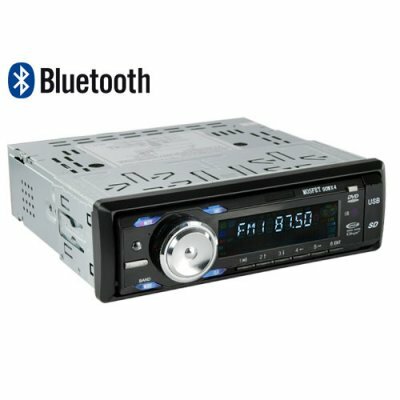 Bluetooth function is only for playing music files from your phone to the radio, No RDS function is not realy practical. Also the titles of the MP3 are not shown in the display, only the playing time. Good design, good sound! good quality,beautifull design, the sound is powerfull, full command on remote control. No RDS, but, it's a good radio. Nice radio, with good bluetooth support for my mobile phone. That is why I bought it in the first place. Would have been a super radio if it had RDS for FM band. Plays my 4GB SD card with no problems. Radio remembers where it stopped playing after switching it on again. Very fast shipment by Chinavasion. I ordered 1 sample on Friday, DHL was here next monday morning 9 'o clock, that is amazing fast shipping from China to the Netherlands!